Zodiac by Neal Stephenson came highly recommended by two of my coworkers who have been passing the paperback version around the office. I didn't feel like I had enough time to read the borrowed paperback so I spent an Audible credit and downloaded the audiobook. When I downloaded the audiobook (and until a moment ago) I didn't realize that Zodiac was a 20+ year old novel - that makes a bit more sense now and makes me a bit more forgiving of some of the less sophisticated pieces of the plot-line and certainly some of the world-ignorance of the main characters. I almost gave up on Zodiac about 5 hours through the audiobook and if I had a book already downloaded in my listening queue I probably would have. I stuck with the book through the end and while I won't put it on my "recommend to friends" list - in the end, the total wasn't quite as bad as the first five hours. While I value a clean environment as much as "the average bear" - I don't agree with a lot of the fruity eco-terrorist agenda that was somewhat glorified in Zodiac. I spent a great deal of the book resenting "S.T." for his methods - even in light of the on-going nuclear tragedy in Japan and the "toxic harbor" that was Boston for much of the late 1980's. There is an awful lot of wordy sections where the narrator (S.T.) just goes on and on with irrelevant mush that has zero value in the plot progression. Ax Norman's narration was pleasant enough. Die-hard residents of Boston (and probably most of Massachusetts) with have a hard time with pronunciation of some of the places and words supposedly spoken as a native of Boston - Naaaa-tick (instead of Neigh-tick), row-te instead of root (ie route 128). Mr. Norman's timing was fine and I expect if the subject- matter had been more captivating I'd likely be much more forgiving of a botched New England dialect. 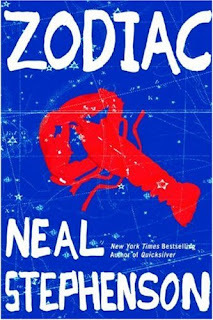 As for an over-all review: if ecological thrillers are your cup of tea and you can forgive a lot of useless statements of out-dated facts and more than a few "captain obvious" chapters you might really love "Zodiac". If you're not particularly big on the topic, leave this one on the shelf. 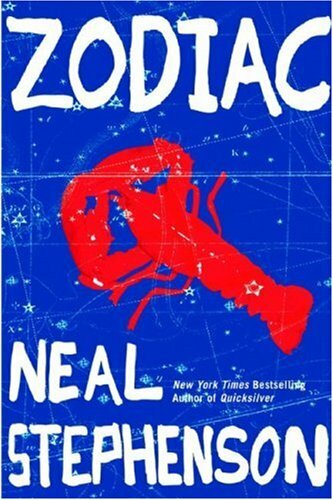 Zodiac by Neal Stephenson was originally published in hardcover in1988, the audiobook version of Zodiac published by Macmillan Audio has an audible release date of November 3, 2009. Zodiac was narrated by Ax Norman and has a running time of 10 hours 19 minutes. Good Luck at AKC Nationals!!! Is it wrong to covet thy neighbor's grass?